Your Home’s First Line of Defense - Guru Security Inc. Treat your front door like your home’s first line of defense for security. To prevent an intrusion in your home, please follow these tips. These are all do it yourself suggestions that can make a dramatic difference in your homes security. Your door security are your home’s first line of defense. 1. Make sure it’s solid to help prevent being kicked in. 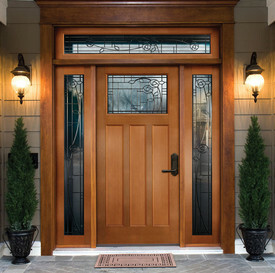 Your exterior doors should be made of solid fiberglass, solid wood, and veneer over a solid wood core, or reinforced metal. 2. Lock your doors with a high grade dead bolt that comes with a minimum 1” throw to secure it to the door frame. 3. Remove and replace the 1 ½’ screws that secure your hinges and dead bolt latch with 3” stainless steel screws. The 1 ½” screws only penetrate the door frame. The double studs used in the wall around the door frame are 3” thick. The longer screws penetrate these studs to provide significant extra strength and help preventing the ability to be kicked open. 4. Peep holes are recommended for discreet viewing. Viewing windows should be over 40 cm from the deadbolt to prevent access by breaking the glass and reaching the deadbolt. Doors that contain glass windows can be reinforced with a metal security grate. These grates come in many decorative patterns, so your home doesn’t have to look like a prison. If viewing windows are making your doors vulnerable use a double cylinder dead bolt that requires a key on both sides to prevent a twist knob from being reached through a broken window. 5. Lock your door. A shocking number of daytime burglars simply walk in through the front door, because the owners left it unlocked. Don’t be easy pickings. Remember your door security is your first line of defense. Guru Security can provide Mississauga and Toronto homeowners with a security solution that is not only economical and will not break the bank. It will also offer peace of mind knowing that you have added extra security to the people that matter the most. Your family!